The self-adherent elastic wrap for horses that functions like a tape, but sticks to itself. Suggested applications include light support and securing, compression dressings and partial immobilization. The Equine Poultice Non-Medicated Pads are layered absorbent pads that are used as equine wound dressings. They can be soaked in a poultice solution prior to application. There are three specially designed shapes/sizes to choose from (depending upon your treatment needs). Kendall WEBRIL® Undercast Padding is 100% cotton, retains fabric consistency whether wet or dry and its mild stretching and cohesiveness holds padding in place. 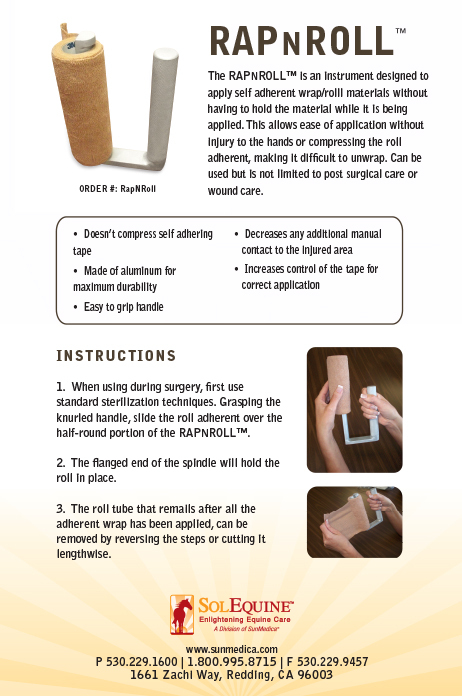 This soft and comfortable wrap is used to cover wounds and hold gauze sponges in place. It can then be compressed and held in place with a horseRAP™, Coban®, and Shurtape®. 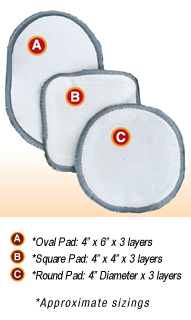 Kendall CURITY® Gauze Sponges Sterile 4" X 4" 8 Ply Sterile 2's comes in a Peel-Back Package. These sterile sponges are well suited for a variety of applications; equine wound dressing, general cleaning, debriding, and as poultice application.